Also, check out the blog posts refer to: Webometrics. Informetrics This scientific discipline uses mathematical and statistical methods to describe and analyse information phenomena and the relationship between them. Informetrics mainly deals with a quantification of the information, measuring of information flows and with the evaluation of information processes. The result of the informetric research may serve for analysis of the quantitative growth of literature, for a measure of the efficiency of information systems, for evaluation of scientific communication, etc. Bibliometrics Bibliometrics uses informetric methods like quantitative analysis and data visualisation to determine the characteristics of bibliographic references, citations, authors, institutions, keywords, etc. Bibliometrics further uses citation analysis to clarify the quality of written documents. Bibliometrics as such can be used to evaluate the intensity of the use of librarian and information services. Scientometrics Scientometrics is an extension of bibliometrics that is focused on the evaluation of scientific research or individual researchers. The assessment is primarily based on the number and quality of citations of scientific work. Using the scientometric approaches, it is also possible to characterise the historical evolution of scientific communication within a given research field. Cybermetrics Cybermetrics includes all previously mentioned disciplines and carries them into the Internet environment. Above all, the Cybermetrics deals with quantitative research of information sources, structures and technologies on the Internet. The subjects of its investigation are all electronic information flows, such as posting in discussion groups, e-mail communication, texting or other forms of communication. 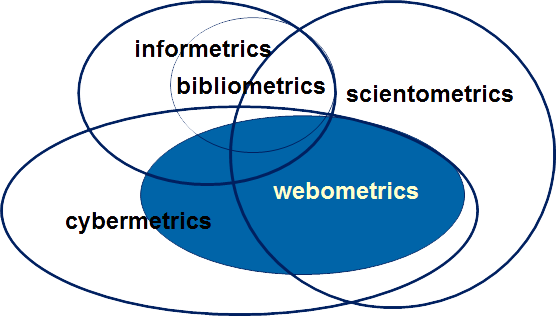 However, webometrics is primarily based on informetric and bibliometric approaches. The information sources that are studied by webometrics are websites, web pages, parts of web pages, words in web pages, hyperlinks, and web search results. According to a narrow definition, webometrics encompasses five basic categories: web link structure analysis, web page content analysis, web usage analysis, web technology analysis and the evaluation of search engines using informetric methods. Malinský, R. (2017). Novel Web Metrics Based on Sentiment Analysis. PhD Thesis, Czech Technical University in Prague, Faculty of Electrical Engineering, Department of Computer Science. Malinský, R. and Jelínek, I. (2016). The Application of Modern Webometric Methods on the Evaluation of Trends in the Social Network Sphere. IADIS International Journal on WWW/Internet, 14(2):58-71. ISSN 1645-7641. Malinský, R. and Jelínek, I. (2016). The Evaluation of Node's Power in the Social Network Sphere. In Proceedings of the IADIS International Conference WWW/INTERNET 2016, volume 15, pages 136-142, Mannheim, Germany. IADIS Press. ISBN 978-989-8533-57-9. Malinský, R. and Jelínek, I. (2015). The Visualizer for Real-Time Analysis of Internet Trends. International Journal of Computer, Electrical, Automation, Control and Information Engineering, 9(12):2174-2178. ISSN 2010-376X. Malinský, R. and Jelínek, I. (2015). Trend Analysis Framework. In Proceedings of the IADIS International Conference WWW/INTERNET 2015, volume 14, pages 161-166, Maynooth, Greater Dublin, Ireland. IADIS Press. ISBN 978-989-8533-44-9. Malinský, R. and Jelínek, I. (2014). Comparing Methods of Trend Assessment. In Casteleyn, S., Rossi, G., and Winckler, M., editors, Web Engineering, volume 8541, pages 554–557. Springer International Publishing, Switzerland. doi:10.1007/978-3-319-08245-5_49. Malinský, R. and Jelínek, I. (2013). Trend Classification Methodology. In Proceedings of the IADIS International Conference WWW/INTERNET 2013, volume 12, pages 389–393, Fort Worth, Texas, USA. IADIS Press. ISBN 978-989-8533-16-6. Malinský, R. (2013). Webometric Oveview. In Proceedings of the 17th International Student Conference POSTER 2013, Prague, Czech Republic. Czech Technical University in Prague. ISBN 978-80-01-05242-6. Malinský, R. and Jelínek, I. (2012). Sentiment Analysis: Popularity of Candidates for the President of the United States. International Journal of Social, Behavioral, Educational, Economic, Business and Industrial Engineering, 6(12):3679-3681. ISSN 2010-376X. Malinský, R. and Jelínek, I. (2011). A Novel Web Metric for the Evaluation of Internet Trends. International Journal of Computer, Electrical, Automation, Control and Information Engineering, 5(9):1008-1011. ISSN 2010-376X. Malinský, R. and Jelínek, I. (2011). Model for Gathering and Processing Data from Web 2.0. In Proceedings of the 20th Annual CTU Student Scientific Conference Workshop 2011, volume 15, Prague, Czech Republic. Czech Technical University in Prague. Malinský, R. and Jelínek, I. (2010). Improvements of Webometrics by Using Sentiment Analysis for Better Accessibility of the Web. In Daniel, F., and Facca, F. M., editors, Current Trends in Web Engineering, volume 6385, pages 581–586. Springer Berlin Heidelberg. doi:10.1007/978-3-642-16985-4_59.